White Knuckle Scorin' is a compilation album released on December 3, 1991 by MCA Records. The CD came with a small comic promoting literacy. Though Mario is prominently featured on both the album cover and the comic, "Ignorance is Bliss" by Jellyfish is the only Mario-related song on the album. The comic book enclosed with the album was a loose adaptation of Super Mario World, done by the same people who had produced the Nintendo Comics System stories. Over the course of the story, characters make references to the songs on the album by title, prompting other characters to say "Song cue," most likely to prompt the readers into listening to the song in question. The story opens with Mario, Luigi, and Princess Toadstool arriving for their vacation in Dinosaur Land (which, as the narrator puts it, is a pretty stupid idea, "but hey, they're plumbers, not brain surgeons"), unaware that Bowser is watching them at that very moment. Luigi complains that there isn't a single convenience store around, and since his Walkman is apparently going dead, he asks Mario if he brought any extra batteries, which he didn't. Peach says that she has a guidebook, which Mario asks if they could trade for some batteries. Peach tells him that "reading opens up new worlds", but before Mario can reply to that, she suddenly vanishes. Mario and Luigi go searching for her, but they only find a dinosaur named Yoshi, who explains that "a big ugly turtle has been muscling in around here". Realizing that Yoshi is referring to Bowser, the Mario Bros. figure that he's kidnapped the Princess. Bowser sets up his song, "Ignorance is Bliss". Over at Bowser Koopa's Kastle, Bowser is telling Peach about his plan to reduce Dinosaur Land to fossil fuel, and then join OPEC as an oil tycoon. Peach criticizes his plan, saying he's too ignorant to be an oil tycoon, but Bowser doesn't care about that, because as he puts it, "Ignorance is Bliss". Later, the Koopalings visit the Princess's cell, intending to torment her for Bowser's pleasure, but she instead reads to them from her guidebook ("How Have You Been"), which they warmly accept because Bowser never reads to them. After that, Toadstool escapes from her cell and sneaks into the room where Bowser keeps his book of magic spells. She quickly skims through it and then rips a page out of it before the guards arrive and take her back to her cell. Once back there, she figures that Bowser has put her here as bait to trap the Mario Bros., so she decides to see to it that that doesn't happen ("Magic in the Night"). Meanwhile, the Mario Bros. and Yoshi have been searching all over Dinosaur Land for the Princess, but despite the progress they've made, they haven't had much luck and are wishing they had read the guidebook. Suddenly, a large rock appears with a note from Toadstool, warning them to avoid the Valley of Storms, although Mario think it says to go in the direction he's pointing. Luigi decides that he and Mario should split up and have Yoshi ferry messages between them. Unfortunately for this plan, Yoshi has lousy memory and doesn't know how to read or write, so Mario agrees to teach Yoshi how to do those things (being "secretly thankful that Yoshi's problem wasn't math, at which Mario really sucked"). The Princess's misleading magic messages continue to appear, one of which comes with a 1957 Chevy and a stretch of Highway 5. As Mario is driving the Chevy ("I Drove All Night"), he comes upon what appears to be the Princess and rushes to embrace her, but it is just an illusion. What Mario does find, though, is that Yoshi's absentmindedness has gotten Luigi lost in Peoria. Upon coming back together, they finally figure out that Peach's messages are all telling them to stay away from the Valley of Storms and realize that she's been doing this to keep them out of Bowser's clutches. With that, they head off for Bowser Koopa's Kastle. The Mario Bros. and Yoshi rush into battle while under a the effects of the medieval-themed illusion. 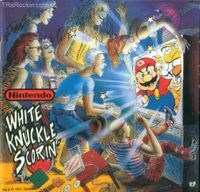 When Bowser is alerted by his spies that the plumbers are coming, he decides to use a really nasty spell on them, but he has Lemmy recite the spell, claiming that he "left his reading glasses in the pantry where he'd been studying the nutritional label on a bag of toasted lard chips". 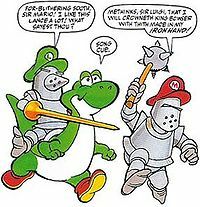 Lemmy, eager to show off the reading skills he'd learned from the Princess, proudly reads the spell, which unfortunately for Bowser, transforms the entire countryside into a medieval motif, which turns Mario and Luigi into armored knights and boosts their confidence ("Iron Hand"). By the time Mario, Luigi, and Yoshi make it to the Valley of Bowser, the medieval illusion is gone, and they continue onward. Along the way, Mario finds a Cape Feather and becomes Cape Mario, and Luigi uses a Fire Flower to transform into Fire Luigi. But once they make it into Bowser Koopa's Kastle, the Koopa King sends an army of wind-up mechanical Koopa turtles to pin them against the wall ("Into the Fire"). 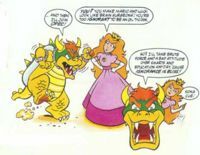 When they finally reach King Koopa, they find that he has placed the Princess in a high-tech cage which then begins to lower into a molten lava pit, which the trio are seemingly too late to save her from ("She Was"). Enraged at the Princess' apparent death, Mario tries to take Bowser down, but is too grief-stricken to put up a fight, so Bowser gleefully stomps him into the ground ("Line of Fire"). Mario, Luigi, and Peach (with help from Lemmy) fight off Bowser and the Mechakoopas. Just then, Toadstool leaps out of the shadows and lands on Bowser's back. Mario, cheered up by her sudden reappearance, boosts his confidence again and starts beating up Bowser. Peach explains that she managed to escape the cage because Bowser stupidly left the operating instructions in there. During the fight that follows ("Turn On"), Lemmy ends up helping the good guys by telling the Princess that hitting Bowser with his own wind-up Koopa turtles would really hurt him. With Dinosaur Land saved, the Mario Bros. and Toadstool decide to return to the Mushroom Kingdom; unfortunately, Bowser ordered his minions to cut off all the Transport Tubes connecting Dinosaur Land to anywhere else. Luckily, the Princess, having managed to steal Bowser's magic book, has found a spell in it that can send them home, but one of them will have to stay behind to read the spell. Yoshi, having learned to read thanks to Mario's lessons (although he thinks Luigi taught them), volunteers to read the spell. As she and the Marios prepare to go home, Toadstool lets Yoshi know that they'll all be "Forever Friends". This page was last edited on July 25, 2018, at 15:29.